Chicken raising is steadily becoming a more popular trend in today’s households. With just a little care, not only will these birds provide you with fresh eggs, but fertilizer for the garden as well. But to be able to raise chicken, not only must you find a place for them to sleep, but also protect them from external hazards. And while you can invest a fair bit of money and time to DIY a coop, we believe it’s wiser to go for a friendlier option in the form of a prefabricated one. Figuring out the right one for your needs can be very confusing though. Don’t worry; today, we bring you a review on one of our favorites. The Rhode Island Homestead Chicken Coop fits all of our needs, and we hope that it fits yours as well. Chicken Coop Company: Why the Rhode Island Homestead? What can the Chicken Coop Company do better? 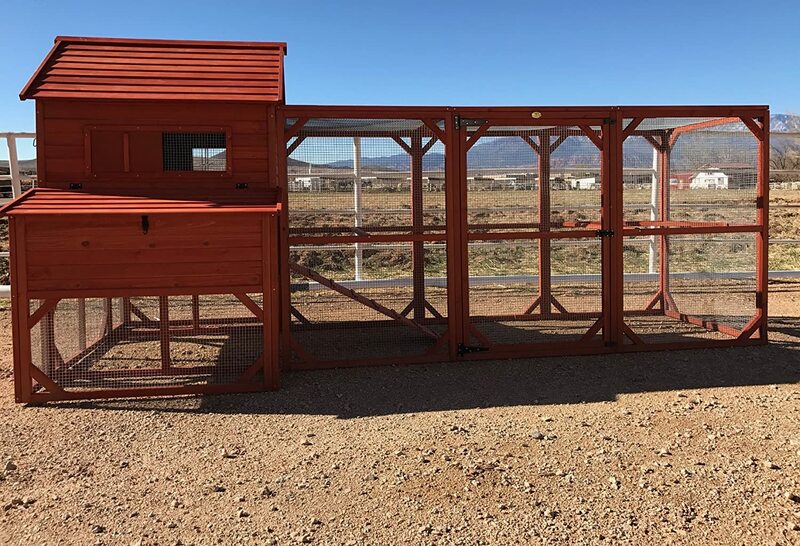 Whenever you wish to buy a chicken coop, especially if it’s online, it’s always crucial to keep a few things in mind, primarily the size, and how well it is engineered, i.e. if the build is stable and sturdy enough to house all your chickens. So, let’s go over a few of the standout features which really sets the Rhode Island Chicken Coop apart from the rest of its competition. This is one area in which we feel the average chicken coop fails. Goaded by exaggerated reviews, we find a lot of customers choosing hen houses that look perfect in their advertised photographs. But in actuality, turn out to be rather flimsy in build and lacking in space. As a result not only is their money wasted, but also their chickens suffer. On the other hand, the Chicken Coop Company’s Rhode Island Homestead Chicken Coop is as sturdy as it gets. When setting it up, we noticed the coops essential dimensions to be 68 inches in width, 67 inches in height and 143 inches in length, while harboring three 37.5 inches roosting rods and a 36 inches one. 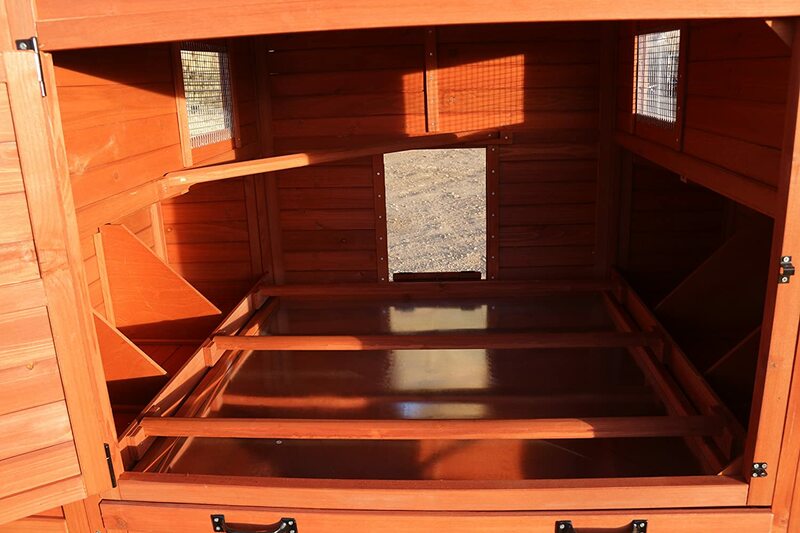 This ensures that the hen house is big and spacious enough for your chickens to have the required amount of freedom. But what makes this large structure solid and durable is the use of heavy gauge hardware, wire mesh and two coats of paint. The wire mesh protects the chickens from leaving the coop, as no matter how much they beak at it, there’s no fear of tearing, and the paint protects the wood from certain weather elements like rain, snow, and hail. The Rhode Island Homestead Chicken Coop is highly ventilated as well. It is significant for most coop structures to have proper airflow, as chickens fall sick more often in housing with poor airflow during extremely warm and dry days. But the Rhode Island coop, along with the spacious build, has additional vents built into it. The extra vents provide excellent airflow, which keeps the nesting box environment healthy and creates the ideal atmosphere for when it is time to roost. The company ships their Rhode Island Homestead Chicken Coop using FedEx from their barn in Utah. They even use bubble wrap and foam as well as a very thick cardboard box which protects the coop from transportation damage. Additionally, each assembly piece is labeled with easy to read instructions, and conveniently enough the holes are pre-drilled. For further ease, they have a step by step video on their youtube channel. Well, not everything is perfect. There are a few things we believe can be improved in the Rhode Island Chicken Coop. Some customers may feel that the coop is not as affordable as they had hoped, and DIY seems to be the preferable choice for them. The wire meshes may withstand the hens pecking at it, but it may not help protect against predators. 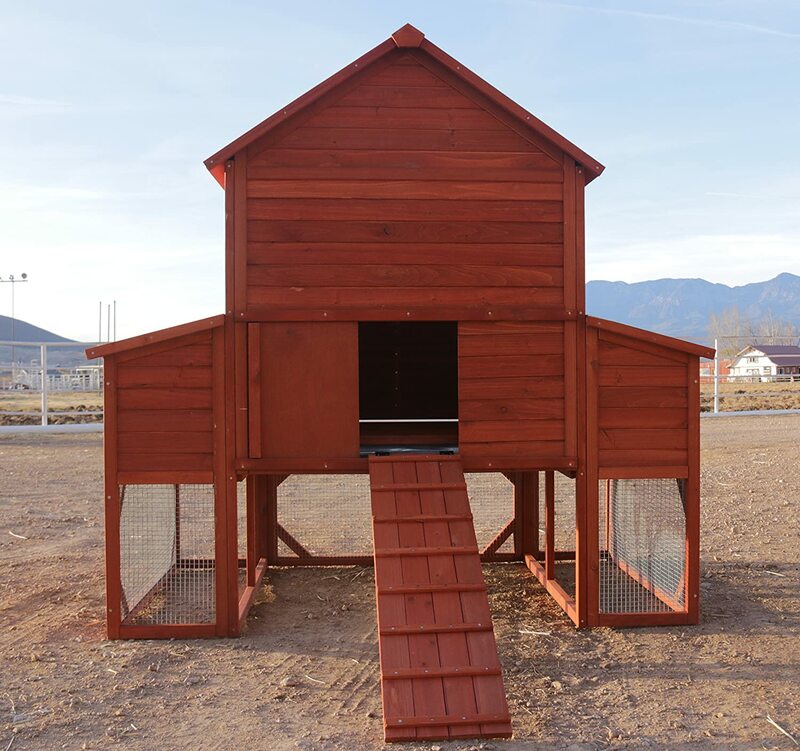 If looked past its cost issues, the Rhode Island Chicken Coop is an ideal homestead project for any form of animal husbandry. Not only will it keep your chickens healthy but it will improve their egg laying ability as well. Hope our review today is able to solve some of your chicken raising issues.